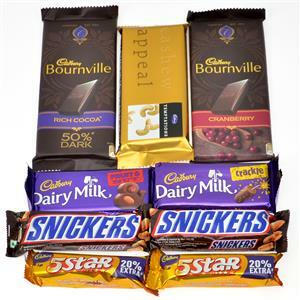 Send Delightful Chocolates Collection to Chennai. Gifts to Chennai. Send Chocolates to Chennai. Description : This tasty tray of delightful chocolates available on Gift2Chennai.com will be loved by your friends and relatives in Chennai as Gifts to Chennai. The chocolates that can be found here are bournvilles, temptations, dairy milks, snickers and 5 stars.